The Sun has changed its character | Watts Up With That? 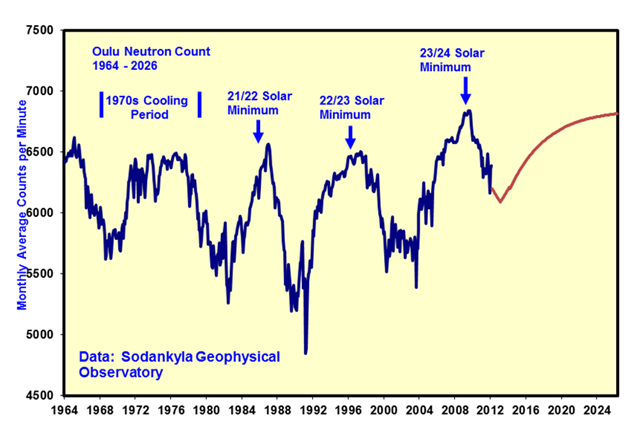 Figure 1 shows the Ap Index from 1932 with a projection to the end of Solar Cycle 24 in 2026. The Ap Index has not risen much above the previous floor of activity in the second half of the 20th Century. It is also now far less volatile. With now less than a year to solar maximum in 2013, the Ap Index is now projected to trail off to a new low next decade. What is evident from Figure 2 is that the spikes down in the F10.7 flux and sunspot count are almost to absolute minimum levels. The underlying level of activity is only a little above that of solar minimum. Similar to the Ap Index, activity is only slightly above levels of previous solar minima. The figure includes a projection to the end of Solar Cycle 24 in 2026 which assumes that the neutron count in the next minimum will be similar to that of the 23/24 minimum. Previous cold periods have been associated with significant spikes in Be10 and C14. Perhaps the neutron count might get much higher yet into the 24/25 minimum. Figure 4 suggests that the predicted result will be associated with a significant increase in cloudiness. This figure, most likely repeating other people’s work, suggests that there is little correlation between neutron count and cloud cover. 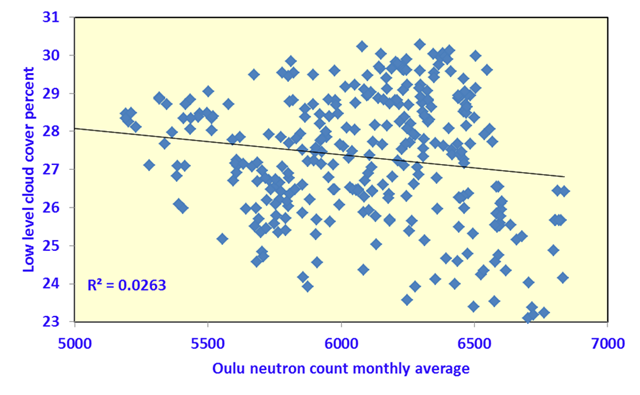 Higher neutron counts may be a coincident with colder climate than a significant causative factor. Perhaps EUV, the Ap Index and other factors are more significant in climate change. Also, on a planet with a bistable climate of either ice age or interglacial, it may be that accidents of survival of snowpack over the northern summer are also important. Perth-based scientist David Archibald is a Visiting Fellow of the Institute of World Politics in Washington where he teaches a course in Strategic Energy Policy. Ahh. Global Warming has cooled the sun. Just as the models show. so Archiebald’s ‘projection’ does not seem reasonable. How much concensus is there that SC24 will finish in 2026? That’s a, what, an 18 year cycle?? I’m not saying Archibald is wrong, I’m saying it’d be interesting to know how certain physicists are on that one. Actually, figure 1 clearly shows the downfall of maxima as calculated by me, from 1994/5. The 1.5B$ New zealanders have paid in to the ETS have given us one of the coldest Junes on recorord. Next thing they be saying is look the tax works. Sun is doing what it has done many times before. As long as extrapolation of the past is confirmed by present, no major character change. I shall say that Archibald very likely is wrong. There is no evidence for such a long cycle, next minimum more likely in 2021. Sun is doing what it has done many times before. What was probably meant was that the change is with reference to the past few centuries. If so, the Livingston & Penn effect [if real] would be as significant change. What I’ve noticed over the last few years is an unusually high north south meandering of the jet stream leading to some very high temperatures and some very low temperatures. I realize a large part of this may be just the cold phase of the PDO but can the amplitude of the north south jet stream meandering be affected by the state of the sun or the change in state of the sun? We certainly seem to have stronger blocking patterns since solar minimum and there have been several times in the last few years where high pressures over the poles have led to strong cold spells in the temperate lattitudes of the northern and sounther hemisphere. In other words what I am trying to say is the weak sun’s signal more likely to be found in increased variability at certain latitudes rather than in changes in the averages. I know that Dr. Hathaway occasionally looks at the WUWT solar threads, (banned his You Tube interview featured on my website), most likely is annoyed by my mocking of his SC24 forecast, I suspect he knows it was related to a comment in an email to the world renown solar scientist (definitely not our Dr. S), and I am calling an end to it. So if Dr. Hathaway pops along to WUWT I would like him to know that I shell not again disparagingly refer to his SC24 prediction and eventually will delete references to it. His prediction went wrong because he misunderstood results of Dr. Joan (sister of Richard) Feynman’s work. Why I am doing it now ? because I think I found out why it works. That chart-graphic looks OK to me up until the crazy brown-line appended projection. Not saying I have a science argument, just an aesthetics one. How about some dotted min-max lines around a confidence interval or something. The Sun has changed its character … sounds like the first line of a Sci Fi thriller. It actually doesn’t work. What does work is the polar fields and proxies for those: slides 22 and 23 of the above. I suppose it was a foregone certainty that as soon as I bought solar panels the sun would go to sleep. Thankfully ENSO is now into El Nino territory. It may counteract some of the negative effects. Forget abt the clouds and jets. I think it is the sun and related to the activity of the sun: the amount of ozone, that determines the development of temperature on earth. Meanwhile, just think how you’re saving the planet. LOL. I made the opposite bet last year. I bought a snow blower in the fall of 2010 and got lots of use out of it that winter. This winter, on the other hand, I didn’t get to use it even once. You could say that I bet $1000 that we would be in a cooling trend for the next few decades. My solar panels save me on electricity. Doesn’t make any difference, cloud cover has to be UP because solar activity is down and thus cosmic rays are up. There are several peaks and one would not know ahead of time which one to pick. What works is the amount of geomagnetic activity near minimum [and that has a weak relationship to the recurrence peak] so it is not the recurrence peak that works, but geomagnetic activity as Wang and Sheeley point out. Don’t try to pretend you know anything about this. 1 Not enough data to draw any real conclusions about what will happen next. 1932 to today is not long for the sun which has been around a while. (4.5 billion years) Archibald really misuses data to create spurious scientific claims. In the fall of 2010 I also bought a snow blower. I guessed how big a one I needed and bought one size bigger. At the end of winter 10/11 I had 11 hours on it. Last winter I needed a bigger one. This spring I had 57 hours total. There was also a three week period when I got behind and couldn’t use it because the snow was too deep. I ended up paying a guy to plow it with a truck. You could say that I made a $5000 dollar bet and lost because I went too small. I am now entertaining the Idea of buying a $20,000 tractor to clear my driveway. Of course the better half… the one that does not clear the driveway, but demands it be cleared, had heartburn about the first $5000. In the beginning of the 1950s when I was in my last few years of primary school education I learnt that we (or the Solar Physicists who study the Sun) knew very little about the Sun, it’s cycles and other behaviours. However one theory’s correctness they were certain about back in those days was that The Sun was the primary driver of all happenings in the Solar System, hence the name. If happenings like those forecast by the “The Milankovitch theory” was ever to be proved to be correct, then it was argued that it was likely to be “cycles in the Sun” – yet unknown – that was the driver that changes the elliptical path of the Earth’s orbit. They admitted back then that they knew a little bit about “Sun Spot Cycles” but ziltch about any other possible “Cycles”. However as I mentioned Milutin’s Theory, it was – back in those days – seen by many, as impossible that the shape of the Earth’s orbit could bring on an Ice Age. – After all, when the Earth is as far away from the Sun as it can be during the present orbital shape, it is “Summertime” in the Northern Hemisphere. – And if the clouds stay away Colorado can be a darned hot place at the moment – or in this orbital spot. So, what has changed during the past 60 years? – Knowledge ways, that is? Although, if that claimed link between long sunspot cycles and reducing temperatures is anywhere near right, that’s still a (roughly) 12-13 year cycle and so potentially not good news. Don’t sell off that snow blower yet. What is the lag time associated with this? We’ve been beating the solar-drum for a while now, certainly the last 4-5 years. When are we going to start seeing the effects? And they are likely correct, but that does not prove it is CO2. OTOH, there’s one thing I really rather envy you: as the Sun gets weirder, the interestingness of your work must be following something very much like a hockey stick curve. It has to be fun. PS – Have d/l-ed the pdf, for which thanks. Oops, sorry for the misspelling, Leif. I blame learning German at school. I have the same trouble with ‘Neil’. cloud cover has to be UP because solar activity is down and thus cosmic rays are up. Unless we have disturbed low level cloud formation by some means. So your statement should be ‘all things being equal — pollution, aerosols, biological activity etc — cloud cover has to be UP because solar activity is down and thus cosmic rays are up’. Am I the only one amused by Leif Svalgaard showing up like clockwork to once again point out that, in his opinion at least, he is the most knowlegable man in the world? It is quite sad to have this solar maximum having comparable activity to many of the last solar minimums, doesn’t bode well for AGE believers. If those predictions are indeed correct, the earth could very well enter the icebox that it was during the Little Ice Age and Maunder Minimum, but only time will tell. Certainly with one major climate factor, the sun, beginning to drastically change it’s energy output something significant is bound to happen. Unless we have disturbed low level cloud formation by some means. More likely, the correlation has just failed. Voyager, get ready! You’re going to go through the heliopause soon! Bright Sunshine is down a little in the UK (1.4 hours a month) over the last 5 years compared to the previous 5. But it is still the 2nd highest amount. Re Solar Cycle 24 length, Altrock’s green corona emissions diagramme, and the man himself, says that the equatorward progression of this cycle is 40% slower than the previous cycle. 40% slower than 12.5 years makes it 17 years long. Add 17 years to the start date and you get 2026. For this not to happen requires an acceleration of that equatorward movement at some point. In the nature versus nurture arguement, the Sun is definitely in the former camp. It seems that the characteristics of the cycle are set at conception which is the maximum of the previous cycle. We have another 14 years-odd of this cycle to go. If the Earth’s atmosphere has shrunk 25% in volume, what will the heiliopause shrink to? Thank you Leif. I enjoy reading your concise and logical pin pricks to the balloon-headed solar “theorists”. You keep us laymen from getting carried away by fanciful plausible-sounding stories. Altrock’s green corona emissions diagramme, and the man himself, says that the equatorward progression of this cycle is 40% slower than the previous cycle. 40% slower than 12.5 years makes it 17 years long. Great discussion … it seems there is a lot we don’t know about our sun and its effects on our weather and climate. Oh how easy it must be to be a CAGW proponent where everything is known and discovered, and all is certain. That applies equally well to the solar ‘enthusiasts’, cf. Archibald’s post upthread. Sorry to ask a really dumb question … but what is the Ap index and what is the significance of it being low? what is the Ap index and what is the significance of it being low? It is a measure of the disturbances of the Earth’s magnetic field brought about by the solar wind hitting the Earth, and thus gives us information about the solar wind and the sun’s activity. 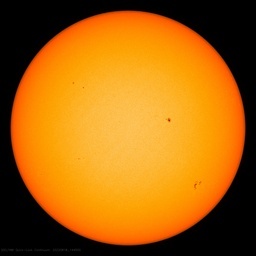 A low Ap means that the sun is very quiet with few sunspots and solar storms. southern one not so, too much moving liquid around. But solar cycle 23 was 12+ years long – yet UAH global temperatures are still about 0.3 deg above the average for the 1981-2010 period. David Archibald continually refers to a “1970s cooling period” on many of his graphs which he blames on the weak SC19, but there wasn’t cooling in the 1970s. According to every global and NH temperature record I’ve seen, it actually began warming in the 1970s. The cooling began in the 1940s and ended in the 1970s, i.e. during solar cycle 19 (also 12+ years). My simple sample displaying the drop in maxima does prove that global cooling has started and for all people (like me) not making money out of “global warming” , that is something to be excited about. It seems you are still denying that it is in fact getting colder? What is missing in this presentation is the development of the UV and, affected by this, the concentration of ozone. IMHO that is what is causing the drop in heat that we get from the sun. Do we have any figures on that? Might be a whole lot more to ozone that that perhaps. Consider the trendlines on the top graph inverted. Interesting timing in the greater scheme of things. From climate point of view, subject most of us are interested in, I think AA (or even better IHV) index tells more, only problem I have with is Bartels rotation, Carrington tables would be more useful. Possible relationship between “Noctilucent Clouds” and Solar UV production?? Less UV more Noctilucent Clouds traveling further South [usually more North. +70 lat.]. Since the Noctilucents are composed of small ice crystals, extremely high in the atmosphere [~250,000 feet], and are reflective, maybe this is one of the UV relationships to the Earth’s Climate…. More UV less Noctilucents [less reflectivity] more warming; less UV more Noctilucents [more reflectivity]. This could be the link between high Sunspot counts [increases in 10.7 cm Flux] UV and a feedback loop to the Climate. Ultraviolet radiation from the Sun breaks water molecules apart, reducing the amount of water available to form noctilucent clouds. The radiation is known to vary cyclically with the solar cycle and satellites have been tracking the decrease in brightness of the clouds with the increase of ultraviolet radiation for the last two solar cycles. It has been found that changes in the clouds follow changes in the intensity of ultraviolet rays by about a year, but the reason for this long lag is not yet known. Noctilucent clouds are known to exhibit high radar reflectivity, in a frequency range of 50 MHz to 1.3 GHz. This behaviour is not well understood but a Caltech professor, Paul Bellan, has proposed a possible explanation: that the ice grains become coated with a thin metal film composed of sodium and iron, which makes the cloud far more reflective to radar, although this explanation remains controversial. Sodium and iron atoms are stripped from incoming micrometeors and settle into a layer just above the altitude of noctilucent clouds, and measurements have shown that these elements are severely depleted when the clouds are present. Other experiments have demonstrated that, at the extremely cold temperatures of a noctilucent cloud, sodium vapour can rapidly be deposited onto an ice surface. Noctilucents reflect radar [outbound energy], and, therefore, reflect Solar energy inbound. a) Less Solar UV, more Noctilucents, more cloud reflectivity. b) More cloud reflectivity at all energy levels, Cooler Earth temperatures. c) Models projections of Flux at ~100 units -> -0.1C/2.5 years. Dr. Hathaway’s July ‘prediction’ appears to be identical to the last. The bottom line, AFA earth’s weather is concerned, is if TSI at the top of atmosphere changes significantly. I think I’ve seen enough of Leif’s graphs/comments to think it doesn’t. Solar magnetic changes are still interesting regardless. Geomagnetic activity is recurrent in the Bartels rotation scheme, not in Carrington rotations. 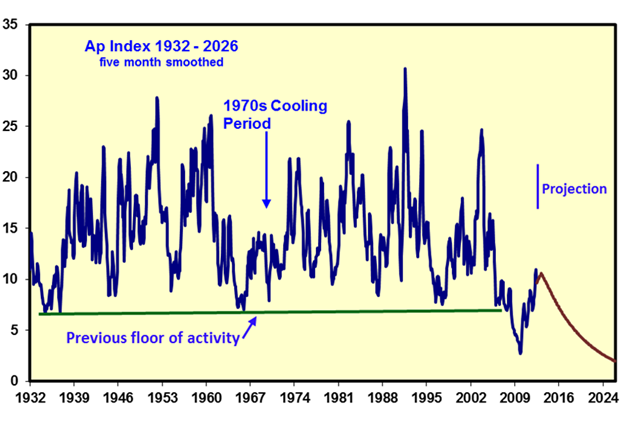 The cooling began in the 1940s and ended in the 1970s, i.e. during solar cycle 19 (also 12+ years). Any thoughts on the appearance of NLCs 2 years after Krakatoa errupted in 1883, stratospheric ozone depletion related perhaps? Any NLC relationship to large partical events causing ozone depletions at high altitudes? It does seem PSCs and NLCs might be canaries in the coal mine but understanding what they’re chirping about is a different matter. How far has the science advanced recently in this respect? Well, Mr. Archibald, it appears crop (corn & beans especially) yields will be down 30% or so. Not because of cold, but heat and drought. Because Death Valley has moved from last year’s Red River, Oklahoma & Texas to this year’s Republican River drainage in Nebraska and Kansas. Figure 3 shows neutron counts vs time, with an obvious cyclic/sinusoidal relationship. Figures 4 & 5, temp vs cloud cover and cloud cover vs neutron count, show a clustering of values and mathematically determined linear relationships that lie between the two clusters. I suggest that colour coding the neutron and cloud cover values may reveal that the time factor has created a non-linear relationship to the data that confuses the neutron and temperature relationships. The time factor is important for what is going on in the sun or in a time-delay relationship between neutron levels and cloudiness. Or that the neutron-cloudiness relationship is non-linear or threshold controlled. I would not discount the neutron-cloudiness connection based on this data, but look deeper to see what other factor is influencing things. may reveal that the time factor has created a non-linear relationship to the data that confuses the neutron and temperature relationships. You make the assumption that such a relationship is a given and then suggest we try to see why it is not observed. It really goes the other way: we can only say that there is a relationship if we actually observe one. Bartels rot is ~1% (27.2753 /27) faster then Carrington. AA spectrum periods calculated from Brot are about 1% shorter then non-smoothed SSN so I would think Carrington rotation would be more appropriate. Over long periods the geomagnetic recurrence rate is very close to 27 days. Bartels’ rotations are exactly 27 days</b). The two systems were defined independently, but it's not totally coincidental that the rates are nearly the same. It's the Sun's influence on the Earth's magnetosphere through the solar wind that causes geomagnetic activity, after all. Stanford University. hm, very close is not same as exactly. thanks so much, I have bookmarked that page (showing good those ozone results). You can see the linear fall since 1970 and the linear increase since – would you believe it – 1995.
then it probably fits into my parabolic curve for the fall in maximum tempratures. So here we really have the whole story. All happening right in front of my eyes. However, my mathematics tells me that this is all part of a natural process. Man had little or nothing to do with it. Please tell me if anyone here disagrees with me? This article’s figure 5 for cosmic ray flux versus cloud cover gives no source for its data beyond Humlum, but it is most likely graphing cloud cover as reported by the ISCCP. 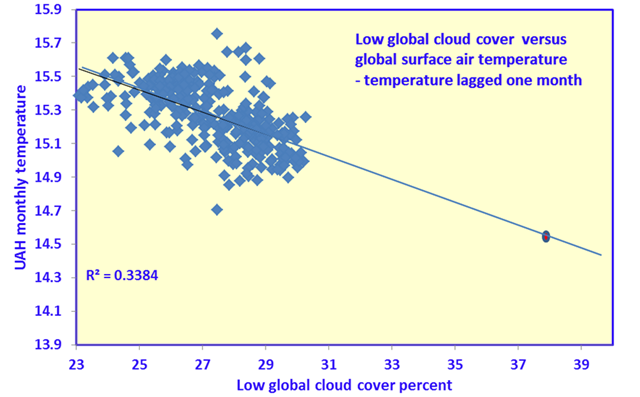 The ISCCP is like the IPCC of cloud cover data (and also used in climate4you.com cloud cover graphs). However, there is a giant problem with that, using a compromised data source (the analogue of using Mann’s hockey stick for temperature history) which is contradictory to other sources which in contrast rather show the effect of cosmic rays. The decrease in Earth’s albedo (decrease in reflectance) observed over 1986 to around 1997 corresponds to a period of declining cloud cover. (Reflecting less sunlight was a top cause of global warming, up to the famous peak of temperatures in 1998, followed by subsequent stagnation to decline in temperatures relative to 1998). That’s to be expected. Fewer white clouds cause less reflection of sunlight, an albedo decrease. Conversely, the increase in albedo over 2000-2004 corresponds to a period of increased cloud cover, again as to be physically expected. Suddenly, though, everything changes for whether the ISCCP’s reported cloud trends match the actual observed albedo change. Look now at 2004-2009. There ISCCP cloud data supposedly disproves cosmic ray theory, with supposedly an overall decrease in cloud cover during the 2004-2009 period of cosmic ray flux increasing. Yet that is exactly when the ISCCP fudges their publicized cloud trend, as may be seen comparing to the albedo change. Observed albedo increased over that time period. True average cloud cover change over that time period was an increase rather than the ISCCP’s reported fraction of a percent decrease 2004-2009. Cloud cover trends didn’t actually start going in the opposite direction of albedo change contrary to physics and past history. Rather, what was special about the year 2004 and onwards is that the CAGW movement recognized one of the greatest threats they have ever faced, with Dr. Shaviv’s landmark discoveries and published papers of 2003. * That arctic ice extent was comparably low in the 1930s to the recent period of hype was also critical to eliminate from common public knowledge, so, thus, again there is utter contrast between what top enviropolitical institutes present as historical (such as the first graph commented on in http://wattsupwiththat.com/2012/05/03/icy-arctic-variations-in-variability/ ) and what cross-checking with historical sea ice charts reveals as http://wattsupwiththat.com/2012/05/02/cache-of-historical-arctic-sea-ice-maps-discovered/ discusses. The Envisat “adjustment” was far more blatant and risky than the ISCCP’s subtle cloud cover trend change, yet it was done anyway. The ISCCP has been very effective, as even most skeptics of CAGW don’t realize what happened. (This is one subcomponent of a major strategy of adjusting data and revising history until solar-GCR climate connections are no longer as readily seen as otherwise the case,* including probably at least a few undercover agents pretending to be skeptics — not universally or centrally orchestrated but just natural when people of similar ideologies, motivations, and dishonesty tend to copy each other’s tactics after seeing what works). Even pulling off the mask in my comment here is unfortunately not remotely enough as too few people will scroll all of the way down here to read it, perhaps a figure 1 to 2 orders of magnitude less than the number being misled by the figure 5 graph in this article based on falsified data. Hopefully someday some submitter of WUWT front page articles will see what would be more helpful. If David Archibald were to correct his article, I would respect him for honesty, and, in that event, one could assume the misleading part of this article’s presentation was just an unintentional result of not knowing how wide corruption amongst some data sources has spread by now. * Temperatures themselves appear to be influenced by a complex superposition of internal forcings from the 60-year PDO & AMO ocean cycles, the shorter ENSO, and others on top of the solar/GCR external forcings, but cloud cover correlation with cosmic rays is particularly high, as shown in the links below. Sorry – my mistake. I did indeed mean Cycle 20. Up until some time ago I would have tended to agree with that statement. I think that is only a minor factor. Most of the energy earth gets from the sun is in the 0-0.5 um range, and most of that is absorbed into the oceans, and subsequently to receiving that radiation, it is converted to heat. When you dealing with effects on the Earth [like Aa] mediated by the solar wind and the sun’s magnetic field driving it, Bartels rotations are the appropriate interval. The recurrence rate is 27.03 days because the solar wind structures recur with that period. Neugebauer, M.; Smith, E. J.; Ruzmaikin, A.; Feynman, J.; Vaughan, A. H.
“Direct measurements of the solar wind speed and the radial component of the interplanetary magnetic field acquired over more than three solar cycles are used to search for signatures of a persistent dependence of solar wind properties on solar longitude. Two methods of analysis are used. One finds the rotation period that maximizes the amplitude of longitudinal variations of both interplanetary and near-Earth data mapped to the Sun. The other is based on power spectra of near-Earth and near-Venus data. The two methods give the same result. Preferred-longitude effects are found for a synodic solar rotation period of 27.03+/-0.02 days. Such high precision is attained by using several hundred thousand hourly averages of the solar wind speed and magnetic field. The 27.03-day periodicity is dominant only over long periods of time; other periodicities are often more prominent for shorter intervals such as a single solar cycle or less. The 27.03-day signal is stronger and more consistent in the magnetic field than in the solar wind speed and is stronger for intervals of high and declining solar activity than for intervals of low or rising activity. On average, solar magnetic field lines in the ecliptic plane point outward on one side of the Sun and inward on the other, reversing direction approximately every 11 years while maintaining the same phase. The data are consistent with a model in which the solar magnetic dipole returns to the same longitude after each reversal. 27.03 is much closer to 27.00 than 27.28 is. It is time you learn a bit from WUWT. You may be overlooking ozone depletion by CFCs etc., which appears to be on the mend but may take a good while yet. You might like to look at the paper published in 2006 that Leif recently posted a link to on WUWT, published by his daughter-in-law (Signe) who Leif says is “the ozone expert in the family”. yes, I was actually thinking about that, i.e. but what if it was more nature playing with us? Just by doing “quickfit” in my head I can see that the ozone depletion and increase since 1970 would fit much better into a hyperbolic curve? in which case most of the observed warming in the past becomes part a “schedule”? Sunspot’s last 6 months daily record shows 23.32 days rotation period for the ‘preferred’ longitude. I would like to take a look at 6-12 months of daily Aa or Ap index, but can’t find a download link. P.S. if you leave the ‘month’ blank, you get the whole year. Rotational signals based on 12 months don’t make much sense. 26.85 days during first half of the solar cycle, and 27.15 days during the last half of the cycle. The two latter ones [with average 27.0 days] due to low-latitude coronal holes. Due to overlaps, for short intervals, you may find just about anything you want in the range 26-29 days, depending on when. Sunspots are sporadic and don’t give you any long duration period. Such depicts a change estimated as ranging up to 11 W/m^2 between part of 1985 and mid-way through 1997, as a consequence of up to around a 3% change in albedo, in the reflectivity of Earth (which is hit by several hundred watts/m^2 of average solar radiation if averaging day and night from poles to the equator). The peak-to-peak change in global average cloud cover from the highest to lowest points over that period in a monthly graph was about 6% meanwhile, up to near 70% versus down to about 64%. Aside from the questionable part on the right, even http://climate4you.com/images/CloudCoverTotalObservationsSince1983.gif shows that. I can not understate the enormous magnitude of a fluctuation of up to 11 W/m^2, of up to 3% in albedo, and of up to a 6% in global average cloud cover. The overall change from albedo variation sustained for multiple years, more averaged over time, was less — more like several W/m^2. Still that’s relatively a lot. Just for initial perspective, when alarmists claim that doubling CO2 would cause such as 3 K temperature rise, they are claiming a climate sensitivity of around 0.8 K/(W*m^-2), as in claiming 3 K of warming from a far lesser around 3.7 W/m^2 of hypothetical radiative forcing ( http://www.sciencebits.com/OnClimateSensitivity ). (Also, when some, assuming similar is true, do calculations for geoengineering, they end up with an estimate of reflecting around 1% or at the very most 2% of sunlight to cancel all hypothetical global warming over the next century under similar assumptions, which is part of why the magnitude of observed albedo change due to clouds instantly stood out to me). Ozone is a separate topic, but the albedo change was outright major in its radiative forcing. Earth’s climate sensitivity is rather limited, to allow how the peak-to-peak warming over near that period was only about 1.3 K while only several tenths of a Kelvin in multi-year-average terms*; of course, external forcings are superimposed on internal forcings like the ENSO oscillation. Absolutely not. I know Enric Palle personally and I know that their goal is to accurately measure the albedo. If their measurements validate ISCCP so be it. You should not attribute dishonesty and manipulation just because you don’t like what the data shows. Nice and clean, SSN, Carrington and polar coronal holes, no sign of the lot of bits you got in there. When you take spectrum over too long period you get lot of spurious stuff. When you take spectrum over too short period you get just some of the temporary messy stuff and can not deduce much about the fundamentals. I call that ‘butterfly collecting’. Who cares what the period is over a given 12 months? What is important is if you can get some physics out of that, other than just a temporary description of a flash in the pan. If you take a different interval you get different periods, not very ‘nice and clean’, but the junk you get by not paying enough. That’s an appeal to personal lack of bias, basically “trust me” if not “trust us.” In the cases I’ve seen where people at Skeptical Science have commented specifically, they consider your efforts as part of what they want: http://lmgtfy.com/?q=svalgaard+site%3Askepticalscience.com . Can you link to any several posts in a row, anywhere out of hundreds to thousands of posts, on WUWT or elsewhere else where you spent paragraphs seriously arguing against any substantial element of the CAGW movement’s claims, in a manner not helpful to it? I don’t even mean 10% of posts or even 1% but just a few, something that someone unbiased and interested only in promoting scientific truth should end up engaged in sooner or later. I don’t mean a throw-away one-liner which obviously would never really be harmful to the CAGW movement, not just something in passing aimed at getting skeptics to let down their guard. I don’t mean merely the same idea by once in a while submitting a link tip at WUWT to a solar-climate connection paper or an article debatedly unfavorable to CAGW but already published anyway, with none of it your own words. And I don’t mean a web page post equivalent to a few one-liners, just listing what you want people to think your beliefs are without actively really trying to convince someone of anything counter to CAGW, without a tenth of the passionate motivation you show for aiming to counter solar-GCR climate linkage studies and data. I don’t pretend to be unbiased myself: I’ve watched false claims on major rise in hurricanes (global frequency flat to declining in recent decades as Florida State University shows if going beyond Skeptical Science’s North Atlantic cherrypicking), tornadoes, mosquitoes, sea level (no faster rise in the late 20th century than the late 19th despite more than a factor of 10 rise in human emissions as discussed in my comment on the latest “official” falsehood of 1 foot California sea level rise within 10 years at http://www.popsci.com/science/article/2012-06/study-says-california-sea-levels-will-rise-more-five-feet-century ), droughts, floods, polar bears, the Medieval Warm Period, the Holocene Climate Optimum, etc. At some point, I’m not inclined to trust the ? ?th claim from individuals funded by an overlapping alliance of groups who basically never apologize for supporting falsehoods on any of the rest of these matters. I don’t trust without asking exactly why. If you look at slide 3 and 20 you may want to assert that I attribute the MWP to them darn vikings and their SUVs as the logical conclusion of your rant. And sometimes you have to trust people [in particular me] especially if they don’t have a dog in the race. I know Enric and what he does [and how he does it]. There is no ‘implied’ goal. Let the data show us what is going on. without actively really trying to convince someone of anything counter to CAGW, without a tenth of the passionate motivation you show for aiming to counter solar-GCR climate linkage studies and data. The CAGW cult is a lost cause to begin with and trying to counter them by playing the shaky solar card is worse than useless, as the CAGW crew also needs the solar connection to account for changes before modern times. Perhaps the best way to counter CAGW is to show that their beloved solar connection doesn’t work, forcing them to accept that there are (perhaps) a multitude of other natural variations in the complex climate system. But, I feel that arguing that point with you and your ilk is just as fruitless as with the CAGW cult. Each side has their own religion and associated set of dogmas and ad-hom patterns. The only thing I can do is to present data and conclusions about a subject of which I happen to actually know something. What you do with it [or not – at your peril] is up to you. When we relate cloud-cover to temperature, I think it is important to realize that most of the clouds in question are symptomatic of convection plumes. More importantly, they indicate convection plumes that are extended by warming due to addition of the heat returned by condensing water. More clouds, for whatever reason, indicate increased convective activity and thus, increased convective transport of heat from the surface. A rising plume of hot air will cool at the dry adiabatic lapse rate of about 9.8 ⁰C/km and quickly be arrested by becoming more dense after cooling below the temperature of the surrounding air, which, in the troposphere, only cools with altitude at a typical environmental lapse rate around 6.5 ⁰C/km. Once condensation begins, however, the moist adiabatic lapse rate of about 5 ⁰C/km applies, allowing the plume to continue rising as long as it has water to condense. I believe this process allows most of the heat from the surface to punch through the barrier of greenhouse gas absorption. I think that talking about clouds as isolated entities is like talking about people as if only the hair on their heads were significant–but perhaps understandable, if they were invisible, except for that hair,. A. Law of Conservation of Angular Momentum. “you and your ilk”. Nice. Well, you and your ilk ooze sneering argument from authority (especially your own) from every pore. On the evidence, doing so is a fundamental goal, not a symptom. It does more than that. Also provides the energy that makes the Earth habitable and enables there to be a climate at all.But solar activity [being energetically weak] modulates the basic input at the barely observable limit. Well, you and your ilk ooze sneering argument from authority (especially your own) from every pore. Presenting data and discussing evidence for everyone to make up his/hers mind in an informed manner is the right thing to do. The authority is in the data not in the person. Time for you to discover the difference. As a practical and experienced engineer I respectfully disagree. -12 months have 13 full rotations (at ~27 days) which is perfectly adequate for the purpose. I leave it there, have an article with some interesting passages to complete . ………Perhaps the best way to counter CAGW is to show that their beloved solar connection doesn’t work, forcing them to accept that there are (perhaps) a multitude of other natural variations in the complex climate system……. Absolutely. The claimed solar-climate link actually supports AGW at the moment. It’s becoming increasingly apparent that if there really is (or was) a strong link then it’s broken down over the past 20 years or so and has been replaced by a more dominant driver. is out of character for any butterfly progression of Solar Cycle we have on record. Leif: “Welcome to Solar Max” Autumn of 2011. Ozone is a separate topic, but the albedo change was outright major in its radiative forcing. You have to see the cause and effect. obviously with more heat coming in, you also get more water evaporation and more clouds, etc. and a variety of other weapons that earth has in its arsenal, come into action, that may put a brake on run away warming. – which is why there is life on earth at all. Engineers are usually not given to your flights of fancy. The result you get from such a short period is valid for that period only and if you select another year you’ll find different values, so your ‘principal rotation number’ is not well defined using such a short period, especially since there are several periods of interest and they beat against each other. But it is clear that you’ll not learn, as usual. A luxury strictly reserved for the spare time mental unproductive activity. For once you are correct: they are unproductive in earnest. As an engineer, one of the first rules I learned was not to waste time & effort reinventing the wheel. Empirical TSI measurements & its variability (insignificant) are the “wheel”. Magnetic fields do not affect a mechanical TSI/albedo/water/water-vapor heat engine. OK, magnetic fields could conceivably affect cloudiness via GCRs, but this is far from being shown to be a significant effect. OK, magnetic fields could conceivably affect cloudiness via GCRs, but this is far from being shown to be a significant effect. Plus that it has been going the wrong way lately, falsifying the claim. (One can tell what the IPCC really doesn’t like by what they minimize, like only mentioning carbon fertilization in passing in several sentences in their giant reports to practically dismiss it in vagueness, rather than mentioning the major growth increase under elevated CO2 — +300 ppm CO2 resulting in around +36% to rice yields, even +24% for the C4 plant of corn, +33% to wheat, and so on under appropriate fertilizer application meanwhile — or the 40 billion ton increase in biomass of global terrestrial vegetation 1910->1990 estimated by ORNL during a small fraction as much relative CO2 increase mixed with climate variation, etc). Your response to such as Dr. Spencer’s http://www.drroyspencer.com/2011/05/indirect-solar-forcing-of-climate-by-galactic-cosmic-rays-an-observational-estimate/ will be either (1) skip over it (2) try to discredit it — utterly predictable. (Likewise on http://www.agu.org/pubs/crossref/2009/2009GL038429.shtml etc). #1 / #2 are the same as those of the CAGW proponents I used to argue with elsewhere. http://www.woodfortrees.org/plot/rss/from:2004/to:2013/plot/rss/from:2004/to:2013/trend highlights, even though of course superimposed on other influences like the AMO/PDO/ENSO/etc. ocean oscillations. You don’t say anything in those slides one way or another about the cause of the MWP or LIA (or Holocene Climate Optimum for that matter) except for the theme of your presentation being portraying solar variation as not being a cause. If having no such post to link, such is a rather one-sided pattern, considering you’ve made probably thousands of posts against there being substantial solar contributions to post-LIA global warming — certainly hundreds at an utter minimum. This is reminiscent of, long ago, my first suspicions on so-called “mainstream” global warming presentations, which started to arise when noticing article after article practically solely presented global warming as causing negative effects — very suspicious for supposed lack of bias, when a fraction of a degree temperature change is in large portions similar to that seen if someone moves tens of miles closer to the equator (something at worst close to almost an even mixture of benefits versus tradeoffs in climate, wildlife, etc). “And sometimes you have to trust people [in particular me] especially if they don’t have a dog in the race. Saying ozone has a major effect is a separate matter from showing the cloud cover / albedo changes earlier discussed are minor. Person C says his object (a bus) masses a lot. Person P says his object (a car) masses a lot, therefore the mass of person C’s object is minor. — That does not logically follow. Such is part of what annoyed me about your response. As implied in such, average UV irradiance at the surface increased by a few percent. (Of course, it gets into a lot more details and specifics, but giving the link is faster than me rewriting much). While not the most convenient source but one I came across quickly for a link here, http://hera.ugr.es/doi/15020034.pdf illustrates how UV in wattage terms is 3% to 5% of all sunlight reaching the surface (a higher portion of the total solar spectrum in space by far but that before the atmosphere including ozone and clouds). If averaged day and night, 365 days a year, from poles to the equator, sunlight of all wavelengths reaching the surface is several hundred W/m^2. So a few percent increase in total irradiance reaching the surface is a few tenths of a W/m^2 change. That is actually quite substantial in climate terms. Do, though, compare to the W/m^2 figures I was talking about before from cloud cover and albedo change. * While total solar irradiance in space is around 1366 W/m^2, the amount passing through a circular area in space with an area of r^2, where r is the radius of Earth, to subsequently hit Earth’s atmosphere is what is available before atmospheric reflectance and absorption, versus the spherical Earth’s 4r^2 surface area. If averaged day and night, 365 days a year, from poles to the equator, average solar irradiance at the surface is somewhat under 1/4th of that: several hundred W/m^2. It’s easy to overlook the changes to the global jet streams, which arrived circa 2009. They being the sluggishness with which they take High & Low Pressure systems Eastward. As for the low clouds, they appeared likewise in 2009 and peaked. All that awaits now is for the Solar Activity to slide back down to 2009 levels, where I would rationally expect the GCR’s (Neutron Counts) to once again shoot upwards. 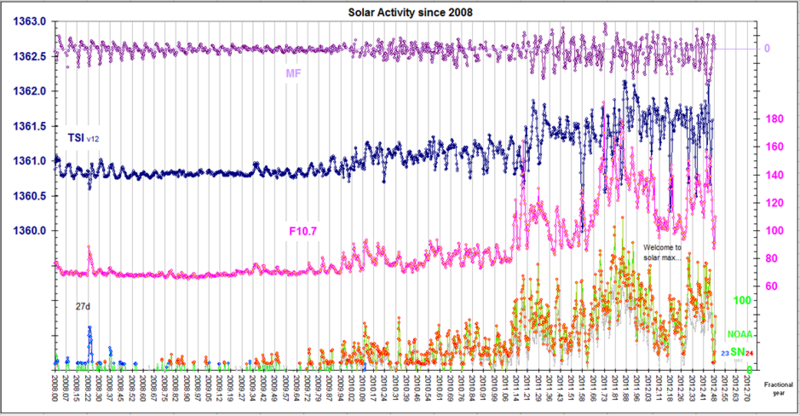 It is no small coincidence that the GCR’s peaked in 2009, the pit of SC23/24 Solar Activity. Fast forward to this year, 2012, where weather systems are stuck like flies on sticky paper, deluging the Pacific Northwest and the UK while the main mass of the US heartland has been roasted by a monolithic High Pressure system. No, there are no changes evident to Earth’s Climate systems, just a little bit of Twilight Zone weather. A little dab will do you. But any complex system has lots of opportunities for internal, natural oscillations. Shows your bias and agenda, God forbid that I should be correct, so all the evil people can slip by contrary views [correct or not]. I guess that every agenda has its own gods, even if the gods are fallible. do you see that the major portion of the energy being cut off by the ozone lies between 0.2 and 0.3 microns? (200-300 nm). So the measurements at 300-325, although indicative, do not help me much…..
Also remember that water absorbs strongly in the 200-300 nm region, which is then converted to heat. I don’t think that the things I see happening have really yet been properly researched. If you have a 10% decrease in ozone then obviously that (white) portion in between the red line and the red body will (at least) become 10% smaller? It is that extra heat coming in and slamming (mostly) into the oceans that caused the global warming 1970-1994. 2) The portion shorter than 300 nm in wavelength is relatively tinier still, even compared to the part of UV-B between 300 and 320 nm. Note the logarithmic scale in the above’s figure 1. Within a few nm beyond 300 nm, when starting to approach what would be UV-C (280nm and less — more precisely: 100-280 nm in definition), in relative energy terms it drops to basically zero before ground level. Change it by any moderate percentage, and the part below 300 nm is still almost zero, whether the measurement is conducted now or in the 1990s or any other time. If one forgives the looseness of this extreme analogy, if we lowered ocean mass and depth by 10%, there would still be about zero light reaching the bottom of the oceans. UV-C at the surface under the atmosphere was next to nil before; it is next to nil now too. On the other hand, though, the change in surface irradiance from the main portion of UV, between 300 and 400 nm, UV-A and a little UV-B, is substantial in energy terms. The signal is robust and easily observed using dozens of methods. Here’s a different angle on it: http://i46.tinypic.com/2yw7711.png . If you consider the signal “barely observable”, you’re relying on grossly suboptimal (in this context) methods. Although incredibly useful, a hammer isn’t the right tool for gracefully sinking a screw. Without explanation of P.5 and M.5 your graph has little value. Looking at my first data set and at the differences between the results from the northern hemisphere(NH) and the southern hemisphere (SH), (especially the maxima!) what we see is happening from my results is that more (solar) heat went into the SH oceans and is taken away by water currents and/or weather systems to the NH. That is why the NH is (was) warming and that is why the SH does (did) not warm. You cannot assume that such is remembered over any length of time. But, now that you reminf me, we have had this discussion before and your new graph adds nothing new, except committing the elementary error of plotting the extensively smoothed values together with the ragged unsmoothed real solar data. Now because of the solar cycle variation of TSI implies a [barely detectable] temperature variation of 0.1C, one would expect some response in atmospheric parameters that depend on temperature. Is that what you think you are seeing? I think you still don’t get it. Read my post again. Do you understand why we measure nothing on the ground? It is the ozone filtering it for out for us, deflecting it out to space. No, Ozone does not ‘deflect’ anything. Ozone absorbs the UV and is heated in the process. That is why we don’t measure anything on the ground. I’m finished dealing with you. No, Ozone does not ‘deflect’ anything. Ozone absorbs the UV and is heated in the process. don’t tell me you have been listening to Phil. You better study that – and challenge me on that, if you dare. Your meme of absorption being converted to heat is a general misconception that I have heard a lot but it is not consistent with actual observations. You better study that – and challenge me on that, if you dare. no need to, as you probably won’t listen anyway.Perhaps you should study this http://igaco-o3.fmi.fi/ACSO/files/daumont_et_al_1992.pdf instead. but do you understand the principle of re-radiation? there is no such principle. UV is absorbed, heating the stratosphere [that is why temperature doesn’t decrease with altitude there, why there is a stratosphere in the first place]. Some of the absorbed light is re-radiated at a longer wavelength. The notion that Ozone ‘deflects’ all UV back to space is nonsense. You did not tell us what you understood from the paper I directed you to. The notion that Ozone ‘deflects’ all UV back to space is nonsense. I did not say “all”, but I do think most of it is bounced of earth. Some of it will be converted to heat but not all. I think astronauts know this. I am sure you have been listening to Phil. They measured this re-radiation from earth as it bounced back to earth from the moon. So the direction was sun-earth (day)-moon(unlit by sun) -earth (night). Follow the green line in fig. 6, bottom. Note that it already starts at 1.2 um, then one peak at 1.4 um, then various peaks at 1.6 um and 3 big peaks at 2 um. You can see that it all comes back to us via the moon in fig. 6 top & fig. 7. Note that even methane cools the atmosphere by re-radiating in the 2.2 to 2.4 um range. unless it was re-radiated=back radiated=re-emitted=reflected=deflected=mirrored. Are you nit picking with me over the terms used by me to describe what is happening ? I wonder. Maybe you are Phil.? I did not say “all”, but I do think most of it is bounced of earth. Some of it will be converted to heat but not all. If it is absorbed it goes into heat, and all of it is absorbed [nothing reaches the ground]. Now, a hotter gas emits thermal radiation in all directions, but since the stratosphere is so thin not much of that thermal radiation comes down to us]. Ozone does not ‘deflect’ UV. See below about terminology. Because the Moon reflects some [7% in fact] of the Earthshine falling on it. Using standard, correct terms is important in any communication and demonstrates a certain level of knowledge and understanding. If it is absorbed it goes into heat, and all of it is absorbed [nothing reaches the ground]. most of it is deflected. Clearly you do not even understand the definition of the GH effect (causing warming) and the anti GH effect (causing cooling). Please read it. It is at the top of my blog. NO!!! most of it is deflected. Define ‘deflected’, here and now. Do you mean ‘reflected’, ‘scattered’, or what? Which one is your ‘deflection’? It helps if you actually read my posts. Note that I will agree with this statement as far as water and solid substances is concerned when it is hit by solar radiation in the absorptive region. But with a molecule of a GHG in the atmosphere, there is little or no mass and most of the neighbouring main gasses (O2 and N2) are “transparent ” over most of the whole spectrum. So when the molecule of a GHG is hit by radiation it fills up in the absorptive regions, is saturated with heat, (cannot absorb more heat because it has no mass), and starts re-emitting the photons in same absorptive region. I am sure I have explained this many times before. Your post [as also the above] does not make any sense. So, ‘deflected’ may mean ‘reflected’ back in the same general direction where the radiation came from, like in a mirror. So when UV if ‘deflected’ it is simply reflected as UV with the same wavelength. Is that what you mean? The ongoing misunderstanding is a product of a gaping hole in your elementary-level stats foundations. I do not have enough information to diagnose exactly what building block(s) you are missing, but it appears to be related to nonstationarity &/or aggregation criteria. I have enough information to know with certainty that your problem is at the level of fundamentals because you are wrong on absolute logic. Thermal wind is a function of temperature GRADIENTS. You are guilty of protracted ignorance &/or distortion by never emphasizing this. There’s something grossly suboptimal about the methods you’re using if you’re finding signals “barely detectable”. a) there’s no basis for communication. b) trust is fatally undermined. I have enough information to know with certainty that your problem is at the level of fundamentals because you are wrong on absolute logic. Tell us the difference between absolute logic and ordinary logic. I have a gaping hole here with the distinction. And you ducked answering my question. OK. FAMOUS last words. To a wise guy who obviously feels very superior. I stand under the (hot) African sun. No wind, no clouds. At a certain time of the day, say 12h00. Humidity is 25% RH. Heat on my skin from IR is (very) hot. Too hot. I have to look for cover soon. Next day. Humidity is 75% RH. Same time, 12hoo. No wind. No clouds. But….heat on my skin is a lot less. I don’t have to quickly look for cover. You tell me: what happened, exactly? Why is there less heat on my skin from the sun when there is more GHG in the air? I want you to understand everything that will explain this observation. 1) did you read and understand http://igaco-o3.fmi.fi/ACSO/files/daumont_et_al_1992.pdf ? 2) What does ‘deflection’ mean? Just ‘reflection’ as from a mirror ? No need to out on a tangent to avoid answering the above. You ignored my question. You keep referring me to all of your papers, but I want don’t want them. I want to teach you to learn to think and understand for yourself what happens when there is more of an GHG in an atmosphere. You must learn to experience it for yourself. No need for textbooks and papers. how many papers exist that show me that global warming stopped a long time ago? So who do you think that I think are the blind men? You must learn to experience it for yourself. No need for textbooks and papers. A little knowledge can’t hurt. you say that GHGs reflect [‘deflect’] the radiation back where it came from [hence UV does not reach the ground]. Now, the Sun warms the ground [try to walk barefoot on asphalt on a sunny day to verify that] and the hot ground via conduction, convection, and radiation heats the air above it [you can feel the IR radiation from the asphalt by holding your hand a few inches above the ground, and any hot object radiates]. Now, according to you, the upwards radiation is ‘deflected’ back to where it came from [the ground], so according to the re-radiation principle, CO2 [and H2O] works its magic by preventing IR from escaping to space [as it is ‘deflected’ back to earth when trying to escape]. See, without any textbooks or papers, you have a good explanation of the greenhouse effect and global warming, fully in line with the most rabid AGW position. Well, I can give a very simple example of how the GH (warming) effect works. Come here in winter and measure the minimum temperature on a cloudless night. If the next day is cloudy, measure the minimum again, and you will notice that it (the minmum temperature) is a lot higher on a (cloudy night). Do you understand now why this happens? Do you know what the infra red spectra of water and water vapor look like? Well, I can give a very simple example of how the GH (warming) effect works. No need to as that is well-known by any competent researcher [and many lay folks too], but how about answering my last post at 8:43 am? …but how about answering my last post at 8:43 am? Actually I did make an interesting observation about this, some time ago. I have a big aluminium sliding door in one of our sitting rooms. I had the glass mirrored. In the afternoons the sunshine comes in and falls on the (floor) tiles. So I wanted to see what the effect was of the mirroring. Carefully, with an IR thermometer, I measured the temperature at one spot in the middle of a particular tile before I opened the door. It was 27 C. I measured one minute after opening the door. It was 30 C. I measured 5 minutes after I opened the door. It was 30 again. I measured again after 5 minutes and then 10 minutes. Temperature of that spot remained at 30 C.
The mirroring does work, i.e. it sends some radiation back. But the tile (I mean: the molecules of the tile) can only absorb a limited amount of photons that raises its temperature. As soon as its reaches its capacity (which seems pretty soon) it starts re-radiating that same radiation (that increased its temperature from 27 to 30). Just remember that the molecules of a tile have much more mass then a GHG molecule. So the instant a GHG is hit by radiation, the GHG molecule starts re-radiating, i.e. acting like a little sferical mirror in the absorptive region. The idea that this absorption is continuously converted to heat (only) is completely rediculous. There is (absolutely) no one who can think for himself. 1) Several times now, I have given you the explanation that GHG’s work both ways: it re-radiates (=deflects, etc.) sunshine 0-5 um (if there is apparent absorption in the spectra of the GHG) causing cooling and it re-radiates earthshine 5-15 um (if there is apparent absorption in the spectra of the GHG) causing warming. taking into account that there 12 hours sunshine per day and 24 hours earthshine per day. 2) If you know anything about statistics and probability theory you would know that you can be 99.5% sure from my results on a random sample of 45 weather stations that global warming stopped somewhere in 1994. 3) the nature of the relationship that I find between the warming and cooling of the earth over the past 37 years is binominal (parabolic), indicating a natural process. At the end of the day, it is clear (to me) that the cooling and warming component caused by an increase/decrease in CO2 /H20 has cancelled each other out. Whether that natural process involves the sun-UV-ozone factor, is what I am still trying to figure out. (BTW, by adding a few more weather stations to my sample, I have now ramped up my correlation coefficient for the drop in maxima to 0.996). You still did not answer my simple question. Is what I said, how you see it? Yes or no? If no, where do I go wrong? Obviously, radiation only moves in straight lines. You must know that from the sun shining through a partially open curtain. If it cannot go (further) down it and if no further absorption is possible, i.e. it has to re-radiate, it would (I think) move at opposite incoming and outgoing angles. But I have to think a bit about that. But, you still have not told me if my description of what I think you are saying is correct. From my experience I would say that in all cases, whether gas, liquid or solid, re-radiation works spherical in every direction, from each molecule, that re-radiates. It is just that with a gas there is much less heat transfer possible. That means that the heat (=re-radiation) that you feel above the sun-warmed street will try and find its way back out to space and since most of it is of wavelength 5-15 um it will not find much obstacles in the sky, (O2 and N2 are transparent) except if it hits on clouds or water vapor (which is the main GHG) on the way up. From my experience I would say that in all cases, whether gas, liquid or solid, re-radiation works spherical in every direction, from each molecule, that re-radiates. 1: you say that GHGs reflect [‘deflect’] the radiation back where it came from [hence UV does not reach the ground]. 3: and the hot ground via conduction, convection, and radiation heats the air above it [you can feel the IR radiation from the asphalt by holding your hand a few inches above the ground, and any hot object radiates]. 5: so according to the re-radiation principle, CO2 [and H2O] works its magic by preventing IR from escaping to space [as it is ‘deflected’ back to earth when trying to escape]. 7: fully in line with the most rabid AGW position. Now you just have to say ‘Yes’ or ‘No’ to each point for starters. If there be any “Nos” we can discuss these afterwards. – I have given you all the clues. UV-O2-03 has another chemistry. I am on BB now. Bb battery now on red. Go back to previous and get link to my blog on GH effect and re-radiation. Your answers would be seven words only. BB can handle that if you can. Ozone (from KNMI Climate Explorer) hits extrema on odd 1/4-cycles. Coughlin, K.T. ; & Tung, K.K. (2005). Empirical mode decomposition of climate variability. Coughlin, K.T. ; & Tung, K.K. (2004). 11-year solar cycle in the stratosphere extracted by the empirical mode decomposition method. Advances in Space Research 34, 323-329. Coughlin, K.T. ; & Tung, K.K. (2004). Eleven-year solar cycle signal throughout the lower atmosphere. Journal Of Geophysical Research 109, D21105. doi:10.1029/2004JD004873. This almost a decade old. Since the latest minimum was some years later than just extrapolation from previous cycles, a strong test would be if the 4th IMF mode also had its minimum displaced by the same amount. Come back when you have found a reference to a modern paper that shows just that. There is already a beginning problem at the minimum in 1996, as the IMF-4 seems to precede the solar flux, but 2009 would be the real test. Once again we see you not differentiating between data & stats (which differ fundamentally). IMF4 is a string of stats (based on a sliding window). Accurate interpretation of stats requires awareness of what goes into them (in this case they centrally summarize a series of events contained in a sliding window, so they do NOT represent something about single, specific events, as do data). Also keep in mind that we are looking at spatial averages, so our “data” aren’t even data. Almost no one involved in the climate discussion pays sufficient attention to aggregation fundamentals. This is THE main reason why the discussion is such a mess. The aggregate peaks will vary +/- QBO to LF ENSO. Someone of your rank should be lucidly aware of this. Ozone’s rate of change is coherent with the solar cycle. Data are real, ‘stats’ are fictional. If they are fundamentally different, it is meaningless to plot them on the same graph. Now, will you disagree that if the data and the stats that were roughly in phase for the period until 2004, but go out of phase for the next cycle and thereafter then there is no causal relationship, or will you maintain that a breakdown the phase relationship [breakdown of coherence] does not matter. The spatial average issue is just irrelevant spatial-temporal mumbo-jumbo. The F10.7 flux is also a spatial average [over the solar disk]. Almost everything you will care to mention is a spatial average [sunspot numbers, geomagnetic activity, cosmic rays, TSI, global temperature, etc]. The ‘aggregation fundamentals’ you rant about are not important conceptual [or even computational] issues. If that summary of events go out of phase with the solar flux while they were in phase before, then the supposition that they are causally related break down. As simple as that. The summary is then also ‘data’. Not fundamentally different from a simple running mean. You’re either missing fundamentals or engaged in deep deception. Either way, it isn’t sensible to continue dealing with you. I would agree with you on that. I have also noticed that the increase in ozone since 1994 and the rate of increase in ozone since then would explain – to me, and, at this stage, probably to me only – why at around the same time, global cooling has started. because of the nature of the global warming – cooling as discovered by myself. The solar flux is then also a string of stats [based on a sliding wind of half a solar rotation on a spatial average over the disk] centrally summarizing the series of microwave emission events within the window]. The purpose of Tung’s Figure was surely to show the phase coincidence [coherence of the signals, if you understand that better] between the two stats, solar flux and IMF-4. Since the latest minimum in the flux stat  is several years later that the extrapolation of the of the 10-yr cycle would give, the minimum of the IMF-4 stat would also expected to be similarly delayed, if there is a physical causal relationship. If so, that would be strong support for causality. If not, causality can be excluded. It is perhaps telling that Tung has not published [AFAIK] on this using up-to-date data. Nope. Back on bb now. I’ve given u all clues to find the treasure. Obviously you did not get that I am here to pick brains of people who thought abt what I had been thinking about. Obviously you did not get that I am here to pick brains of people who thought abt what I had been thinking about. Now, it is OK if you give up and confess that you are not up to answering. If you’re seeing 1994, that’s distorted by QBO & solar. Your interpretation of the window summaries is not sound. Nonsense. but you are ducking the issue: Do you disagree that Tung was trying to show phase coherence between IMF-4 and F10.7 and that if such coherence fails for the 2009 [and later] minima, causality is weakened? Henry says: I WILL try again, in capitals, PERHAPS THAT HELPS. I REFERRED TO THIS IN MY REPORT, SEE LINK BELOW, WHERE IT EVEN STARTS WITH A POPULAR DEFINITION OF THE GH EFFECT. 3: and the hot ground via conduction, convection, and radiation heats the air above it [you can feel the IR radiation from the asphalt by holding your hand a few inches above the ground, and any hot object radiates]. CONDUCTION BY ASPHALT: NOT MUCH. CONVECTION IN THE STREET: DON’T THINK SO. YES, IF, ON THE WAY UP, IT (=THE IR RADIATION 5-15 UM FROM THE STREET ) HITS ON CLOUDS OR WATER VAPOR OR OTHER GHG’S IT COMES BACK TO THE GROUND. H2O VAPOR IS MAJOR COMPONENT, CA. 0.5% ON AVERAGE, EXCLUDING CLOUDS!!! ), CO2 IS MINOR COMPONENT, 0.04%. MY LATEST RESULTS SHOW THAT EARTH IS COOLING! WHERE ARE THE TEST RESULTS WITH THE BALANCE SHEETS ON THE WARMING AND COOLING OF EACH GHG? LOOKING AT ALL MY RESULTS I SAY THERE IS NO AGW, THERE NEVER WAS. THERE IS ONLY NATURAL GW AND NATURAL GC. THE ONLY AGW THERE IS YOU REMOVING A LOT MORE SNOW NEXT WINTER. Instead of seven ‘yes’ or ‘no’ you go off on tangents, so, no, it didn’t help. Now, try again. You may even capitalize the YES and NOs. Clearly you know it all. I will leave it as stands for others to learn something from it. We want to learn how much YOU know, so please answer with seven YES or NOs. That is also 38 years ago, not 37.
as seen from the energy that we get directly from the sun. I guess it will hoover around for about a year in any case in the zero area so I am reasonably happy with your 1997. If I look at the Swiss ozone results and I fit those results in a polynominal of the 3 order, I definitely see a bending point at just before 1950 and yours at 1996 or 1997. Amazing.